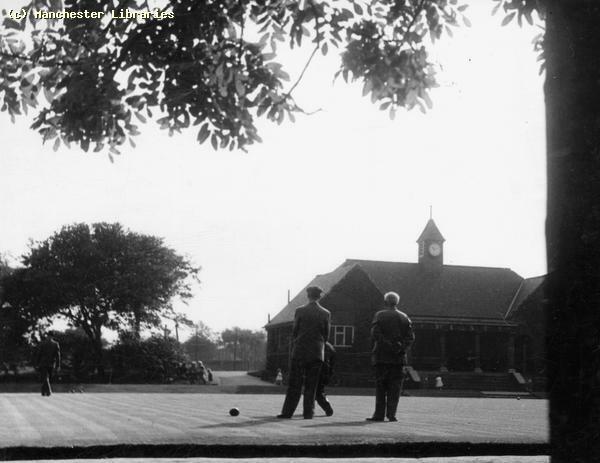 LINKS Sports & Leisure, Parks and Playing Fields. This page is intended to be a reflection of Sport & Leisure pursuits during the 40's 50's & 60's. 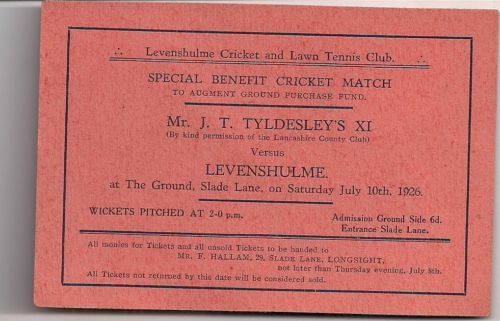 I have little knowledge of the sports, both amateur & professional, that occurred in the Levenshulme area. I will need assistance on this subject from readers of these pages. 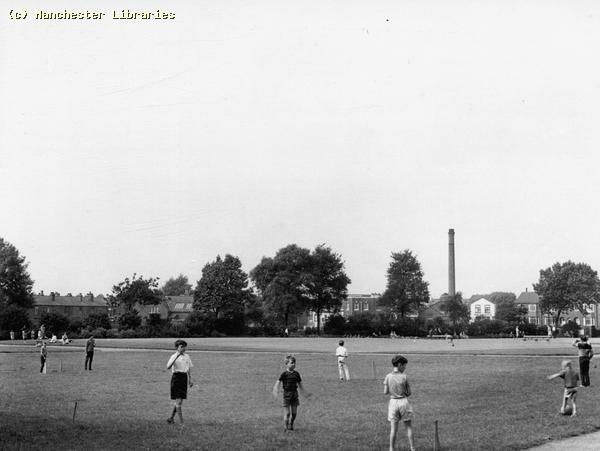 However, I would assume most local sports took place in the many parks & playing fields dotted around the Levenshulme area. 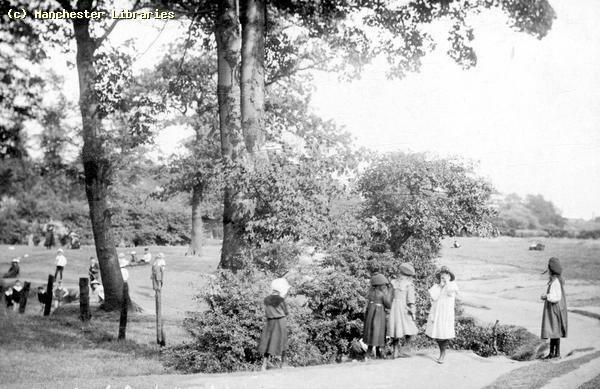 The parks that I remember personally were Chapel Street Park & Errwood Park, both well cared for in the 1950's, by resident groundskeepers & the "ever vigilant " Parkie!! 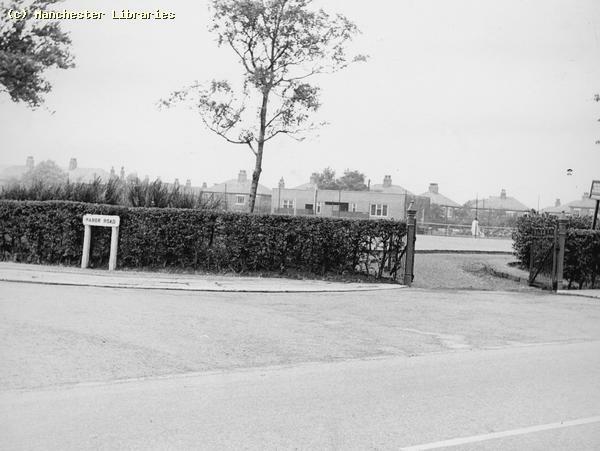 The local playing fields were Greenbank Playing Field between Manor Road & Barlow Road, & Cringle Fields off Crossley Road & Errwood Road. 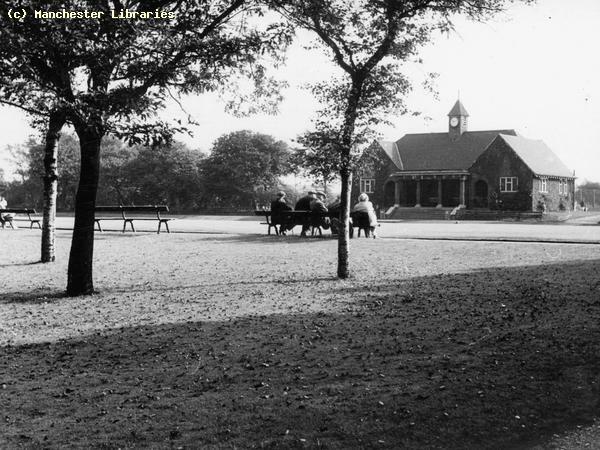 The Band Stand in Errwood Park. 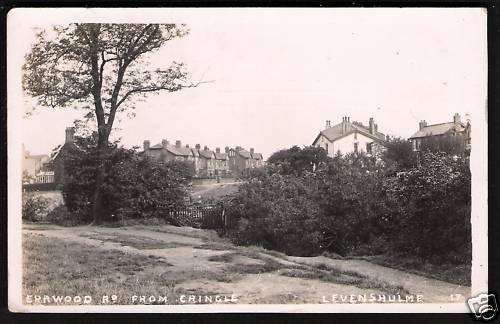 This is taken from a postcard, probably pre-WW2, as it states it to be Cringle Fields! 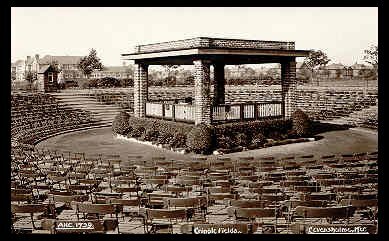 The bandstand was a prominent feature of the park. 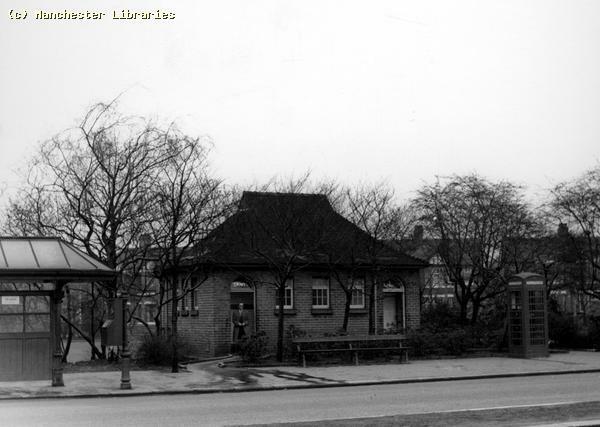 It was probably built in the late twenties or early thirties in a "modern" style. 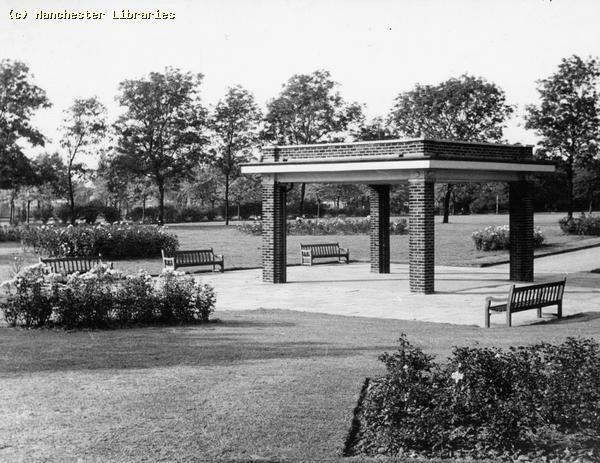 The wooden platform fell in to disrepair in the 1960's, but the roofed structure was retained as the centre piece of some formal flowerbeds. It may still be there if it has not succumbed to "vandalism"!! 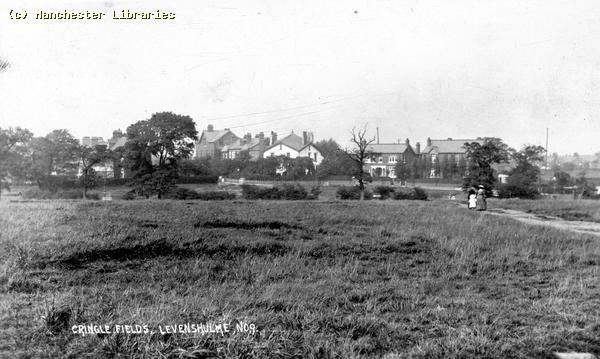 NOTE Levenshulme Girls High School in the background & Errwood Road virtually devoid of trees. 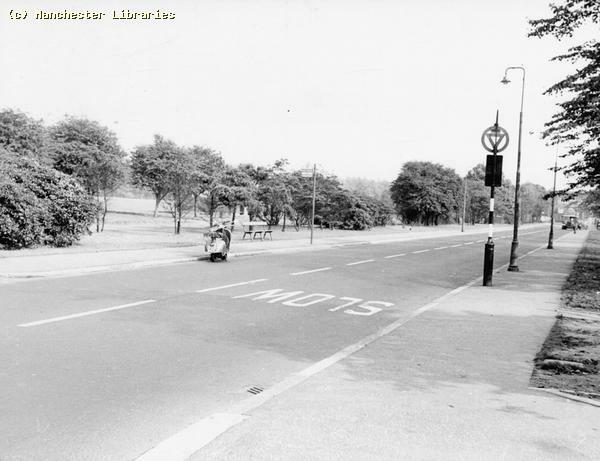 This is the approximate location of the Bandstand. Compare with the above photo. When was it demolished? Photo taken December 2007. 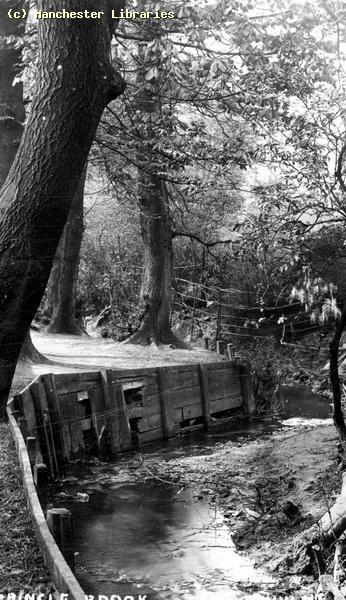 Two photos taken in Errwood Park in the early 1950s. 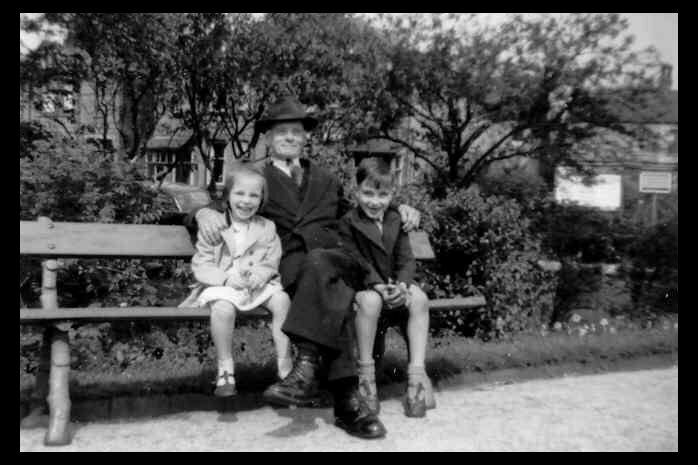 The first shows my wife Mavis, her brother David & her Grandad, Albert Yarwood. 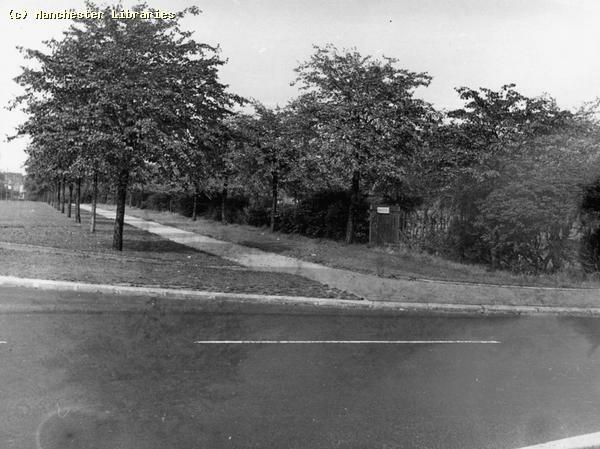 Taken near the park gate at Davenhill Road. 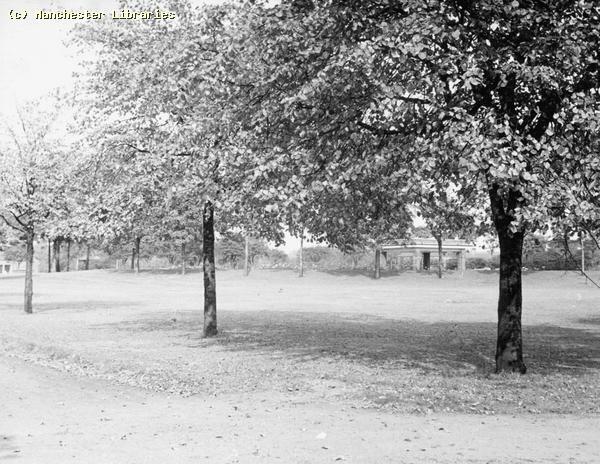 The second, again with Mavis & David, was taken at the back of the Bowling Pavilion with the Tennis Courts in the background. 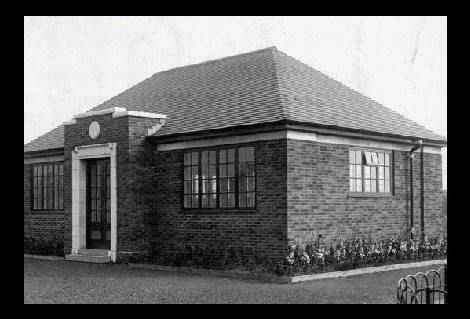 Do you remember the Nursery/Garden Centre on the corner of Clare Road & Davenhill Road? I seem to remember it was called " Davenhill & Berry"! You could get sweets & glasses of mineral water there during the summer. 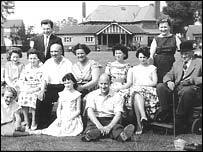 This Photo was taken in December 2007 in the approximate location where Mavis, David and Grandad Yarwood are sitting. 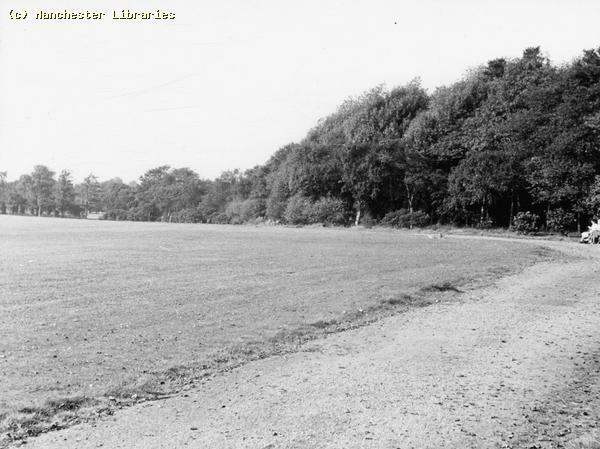 The vegetation has certainly been thinned out since the 1950s. The above two photos, probably taken shortly after the bowling pavilion was built, show how the building looked when I was a child. 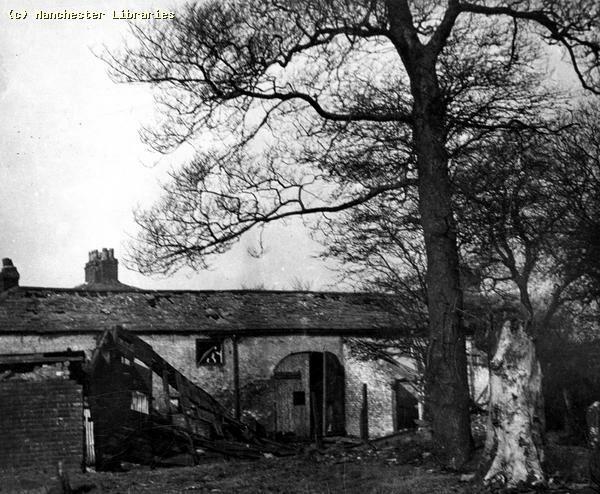 The front and back were shelters, and the side rooms housed changing rooms and toilets. Compare to the 2007 photos below. What happened to the central turret? Does this building serve any useful purpose now or is it just an eyesore!! 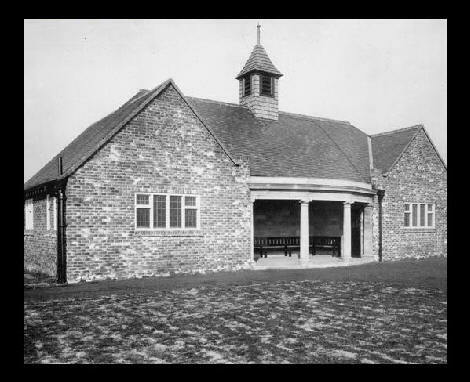 The Errwood Park Bowling Pavilion December 2007. Is this vandalism or what? Did they really need to paint the building? 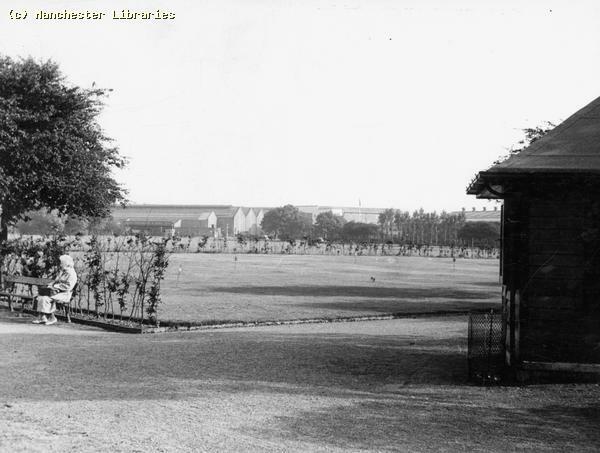 Another view of the bowling green and pavilion in earlier days. 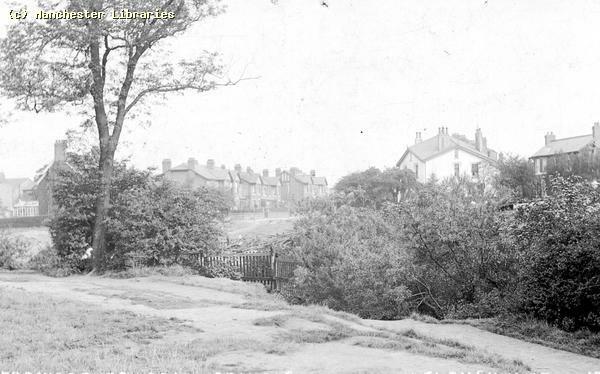 Note the houses on Errwood Road before the trees had grown. 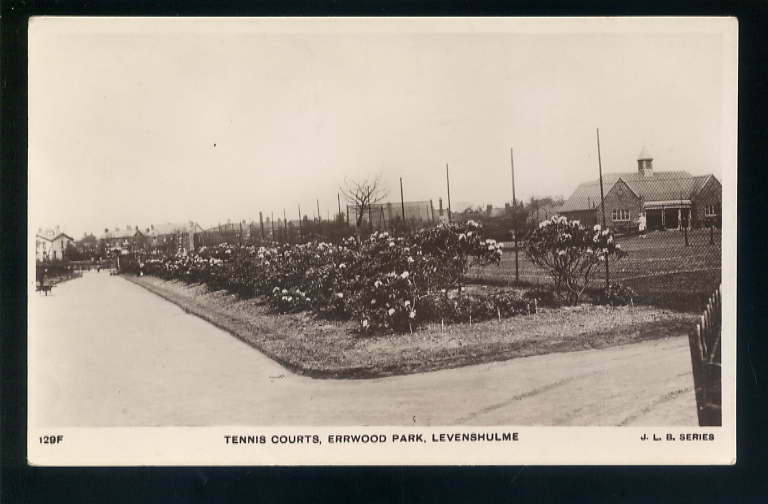 Tennis courts Errwood Park pre-WW2. 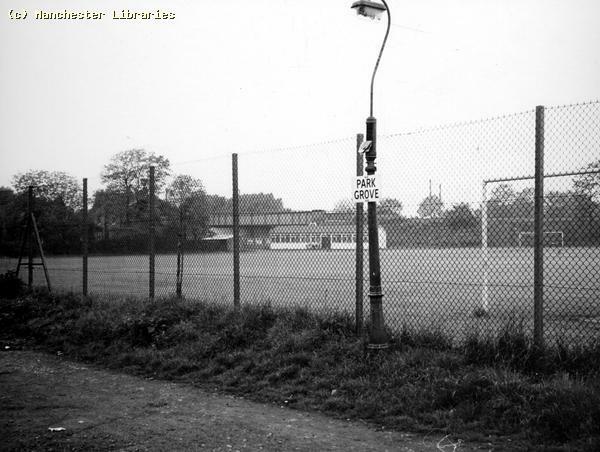 There were no courts in this location by the 1950s. 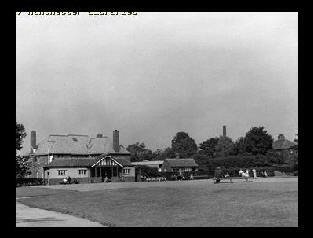 Note the bowling pavilion. 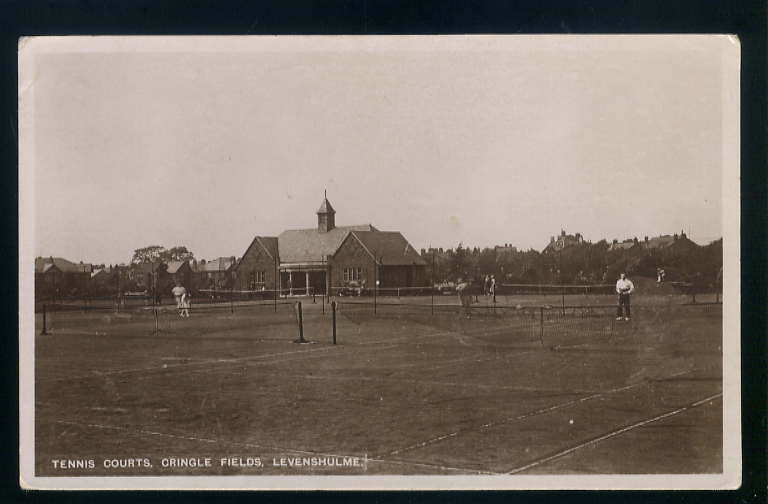 These were the tennis courts that I remember. Still there I think! 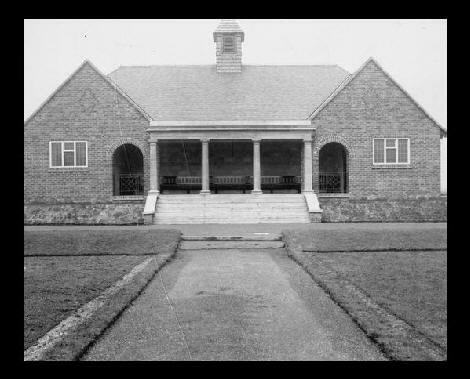 This building, which seems contemporary with the Bowling Pavilion, was used in the summer months as a Refreshment Room or Cafeteria. You could buy mineral water, tea, coffee, sweets and sandwiches. There used to be a drinking fountain with a metal cup chained to it just outside. How unsanitary! Yet we all used it, and survived to tell the tale!! The building has been used for many years as a child day care centre. Note the fences and razor wire on the roof. 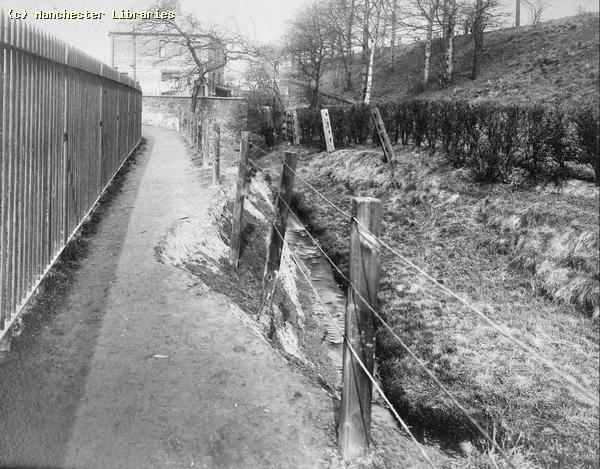 Stalag Errwood maybe!! A sign of the times in our modern world. The Refreshment Room in December 2007. 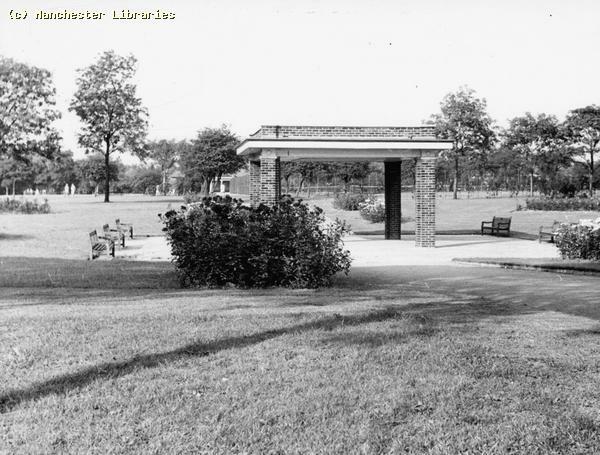 This is a view of a shelter that existed until the 1960s. 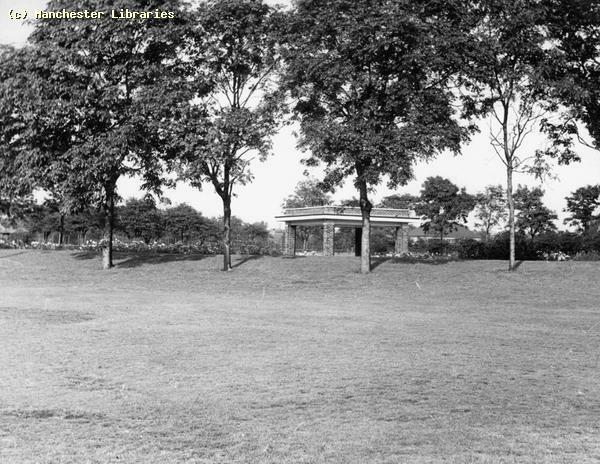 Contemporary with most of the other structures in Errwood Park, it was situated south of the bandstand parallel to Crossley Road. 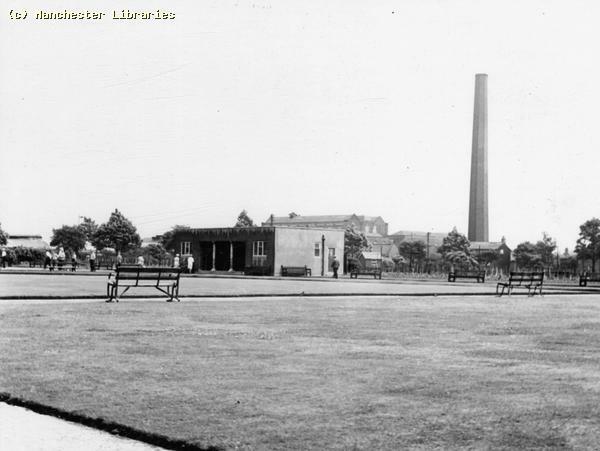 In the background you can see the Crossley Motors factory, and the tall trees surrounding the open air swimming pool. 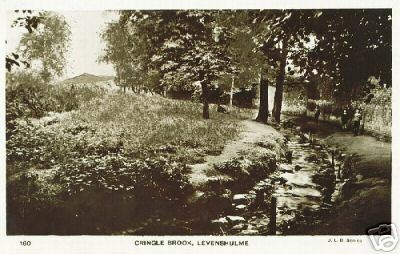 Cringle Brook meandered through South Levenshulme, and was perhaps the most well known water course in Levenshulme. 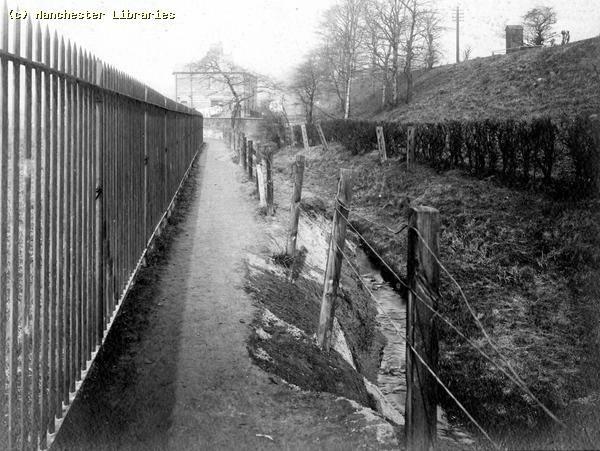 It starts somewhere on the edge of Levenshulme near Lloyd Road and disappears into a culvert on the West side of Errwood Park. 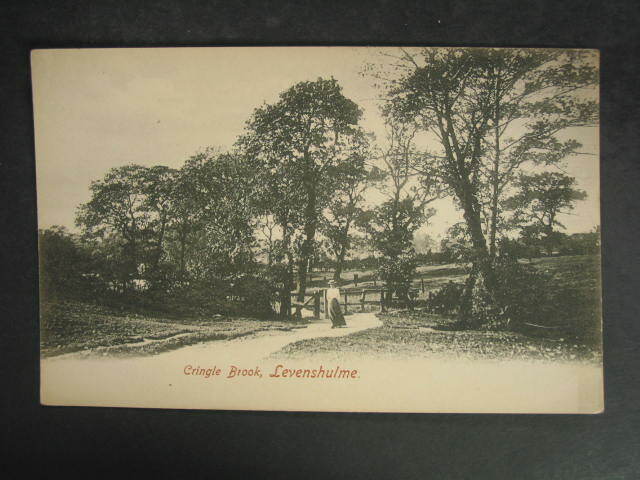 According to the 1907 Ordnance Survey Map, Cringle Brook becomes Black Brook and forms the border between Levenshulme and Heaton Chapel. 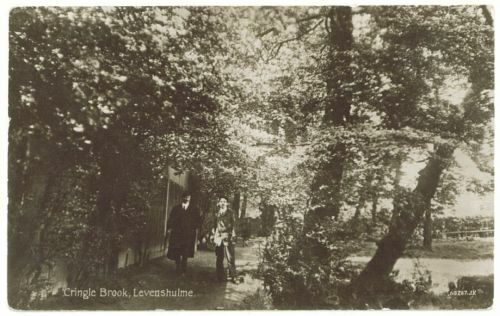 The following images show the brook at various times during the 20th Century. 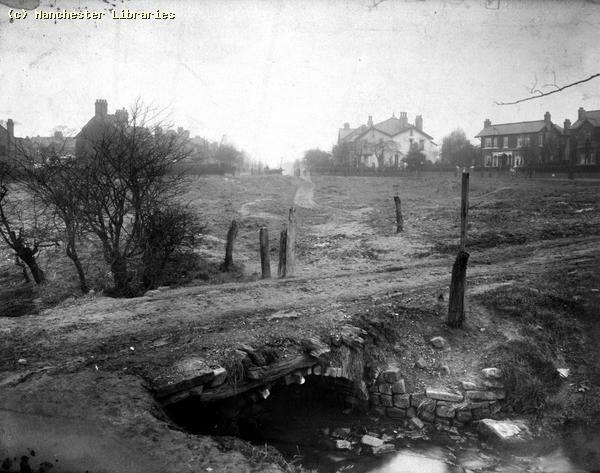 Cringle Brook near Woodlands Ave December 2007. Cringle Brook near West side of Errwood Park/Cringle Fields December 2007. This is where the little bridge used to be and where it disappears into a culvert. Does it appear above ground anywhere north or west of this location? 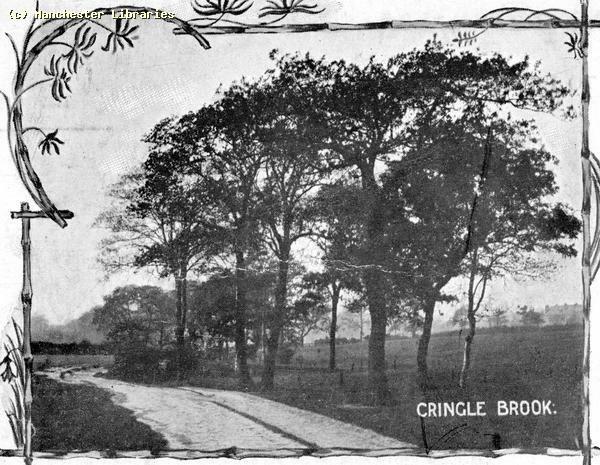 Another view of Cringle Brook, exact location unknown, probably early 20th Century. ( via Ebay ). 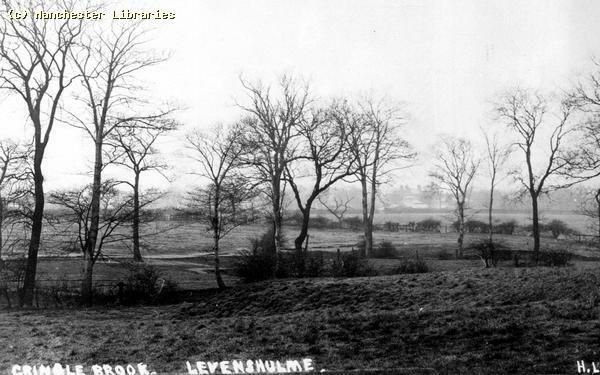 Another early view of the Cringle Brook area. 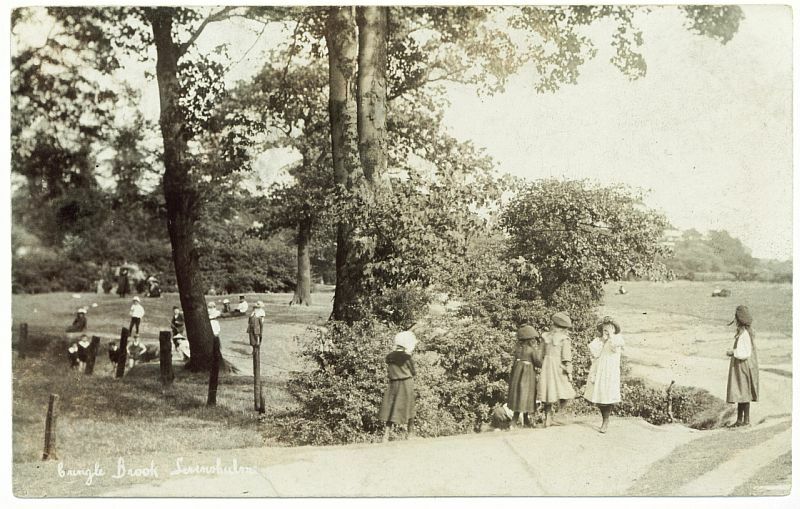 Note the boys in straw boaters and uniforms. 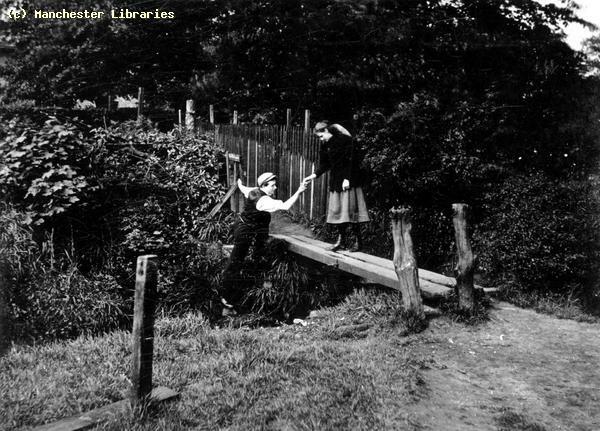 This photo could also be in the vicinity of Cringle Brook. 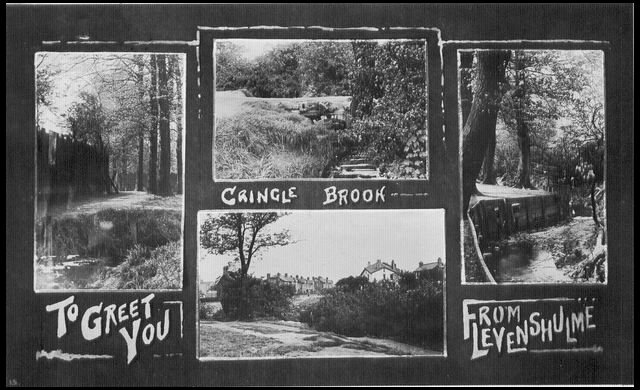 Cringle Brook was certainly a popular beauty spot at the turn of the 20th Century. A very rural scene. Another Cringle Brook view. When did the brook cease to be a beauty spot? 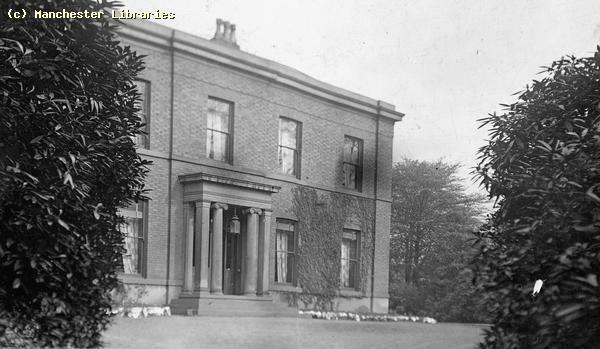 Brook House and Farm, along with Brookfield House and Burnage House stood on the land that later was developed into Errwood Park. All these properties still existed in 1907. 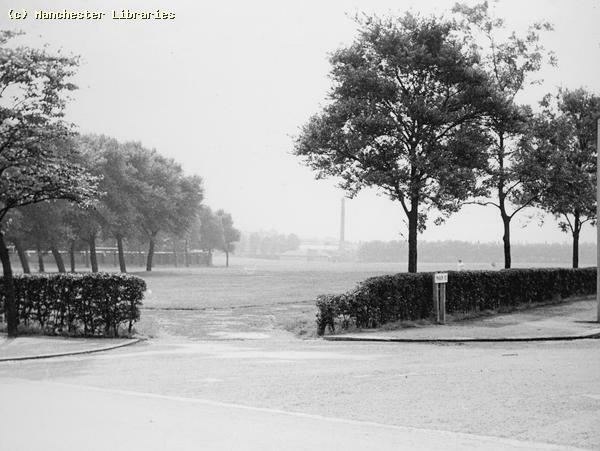 I always considered Crowcroft Park to be in Longsight, but with the boundary changes over the last century who knows. 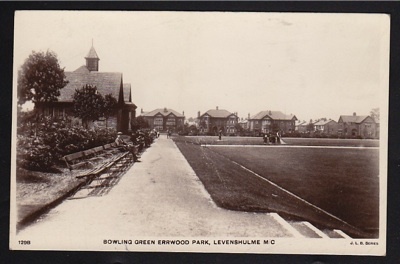 This postcard, found on the Internet, definitely states "Crowcroft Park, Levenshulme"!! 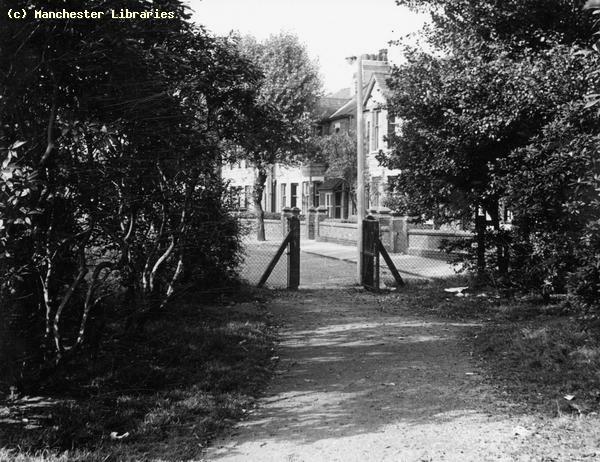 Chapel Street Park has changed a great deal since my childhood, but is reassuring to see that the original gate posts are still in existence. 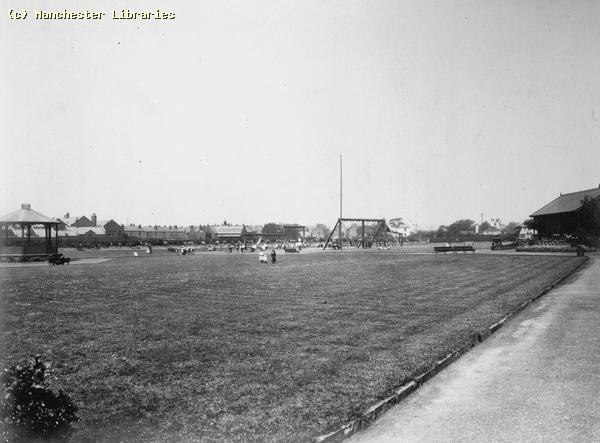 There are inscriptions on the posts, probably commemorating the opening ceremony and the dignataries who took part. The inscriptions are very badly weathered, but someone may be able to decipher them. Help needed on this. 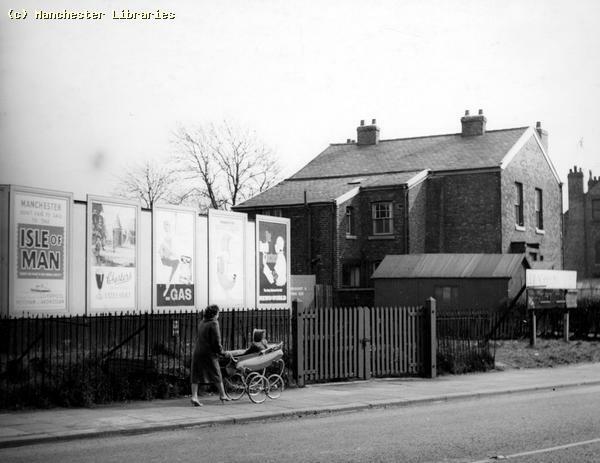 The two photos above show Chapel Street Park in the 1964. 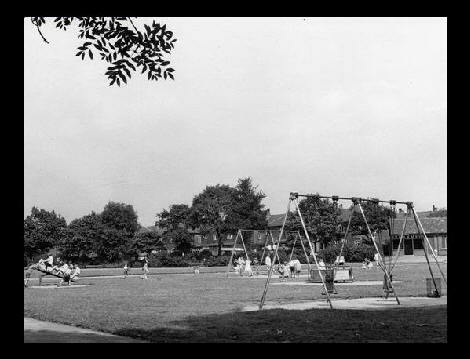 These were the original swings, roundabouts, see-saw and, out of frame, rocking boat that were installed at the end of the 1950s. 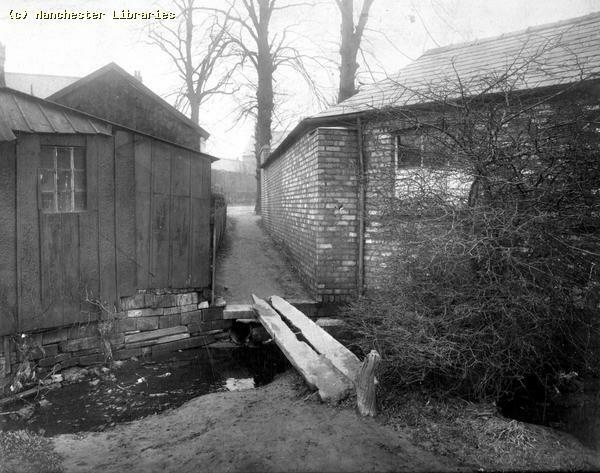 Notice the original shelter and toilet block in the background. 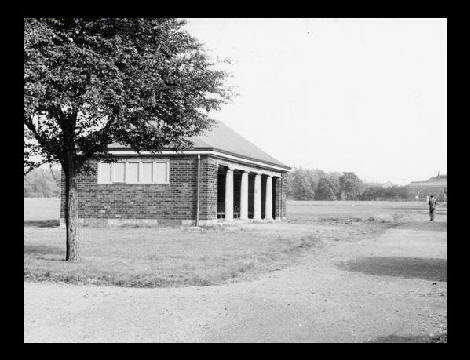 The second photo shows the Bowling Pavilion, Park maintenance building, and dominating in the background the rear of The Bluebell Inn on Barlow Road. 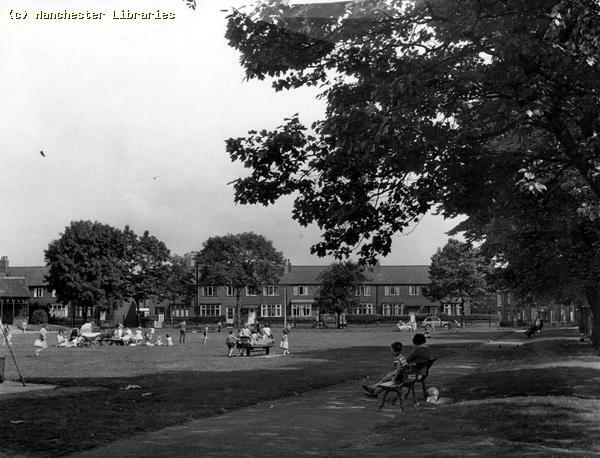 A family group in Chapel Street Park 1950s. 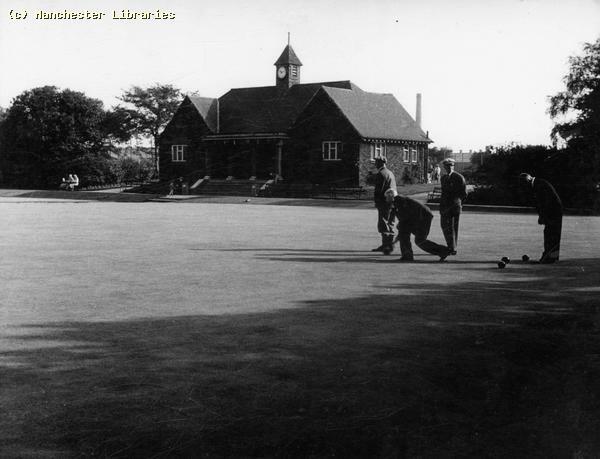 Note the bowling pavilion. 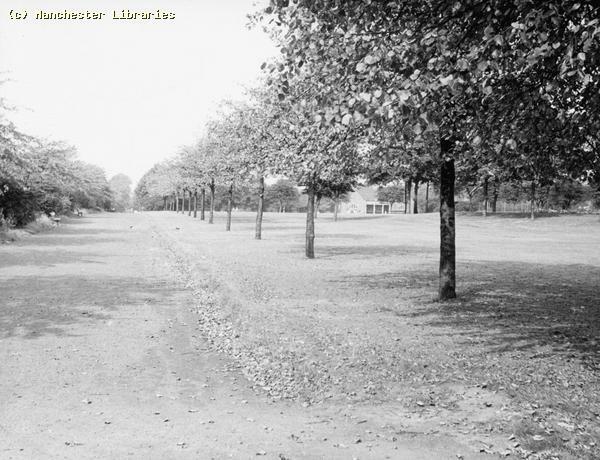 Greenbank Playing Fields and Park. 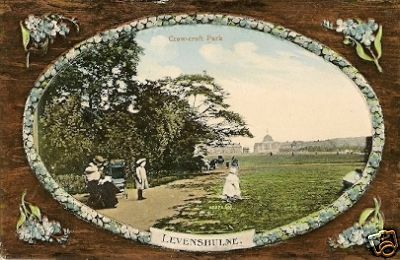 Do you remember the Levenshulme Funfairs? I found this photo on the Funfair Society site. 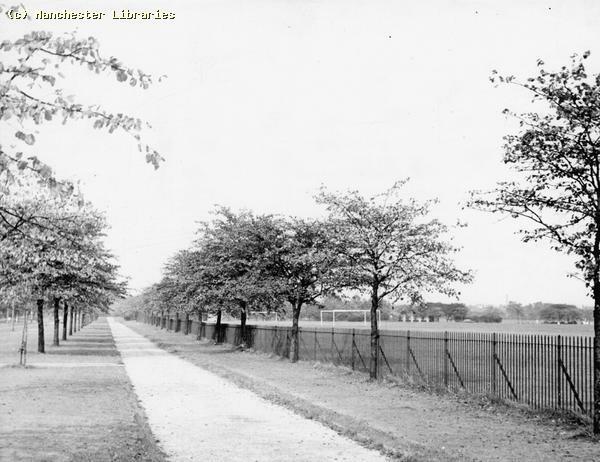 Taken on Greenbank Playing Fields, close to Barlow Road. The year is not mentioned! 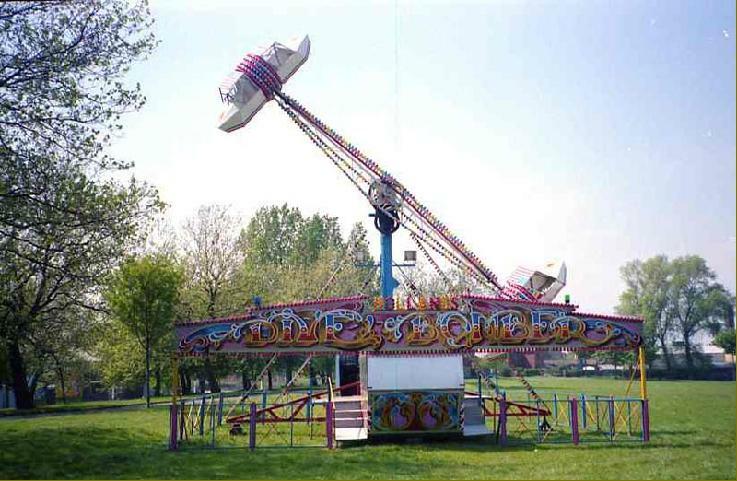 A very typical fairground ride. 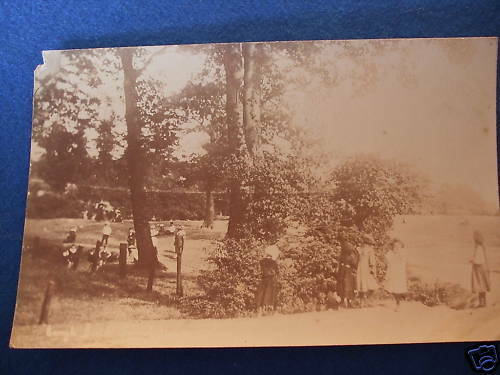 The photo looks to have been taken either during the set up or take down of the funfair. There is no evidence of worn out grass, so I suspect it was during the set up!! 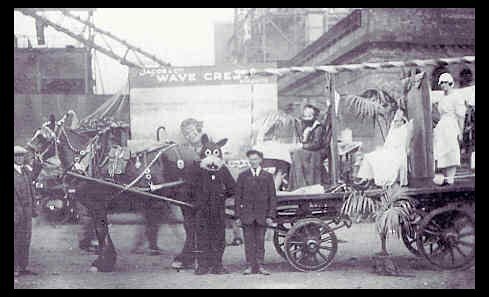 Does anyone out there have any Levenshulme funfair photos. 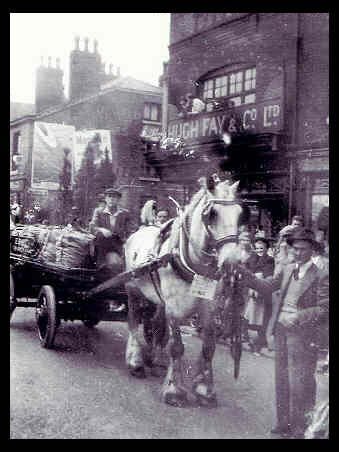 I seem to remember that two fairs visited during the summer. 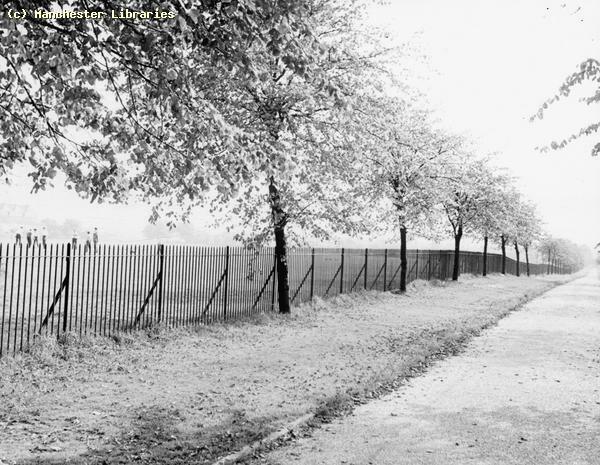 One on Cringle Fields, usually early summer, and later on Greenbank. 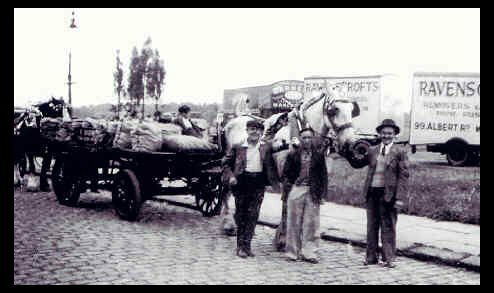 They may have been the same fairs. 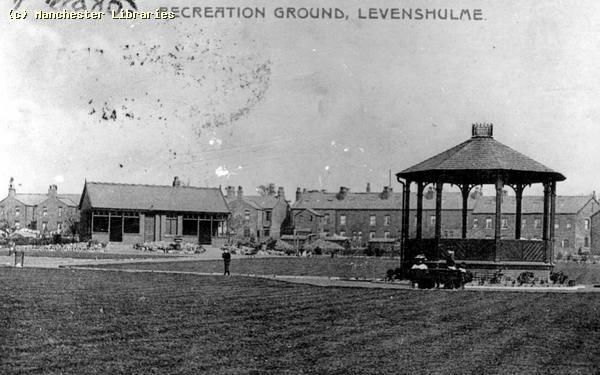 Do fairgrounds still visit Levenshulme?? 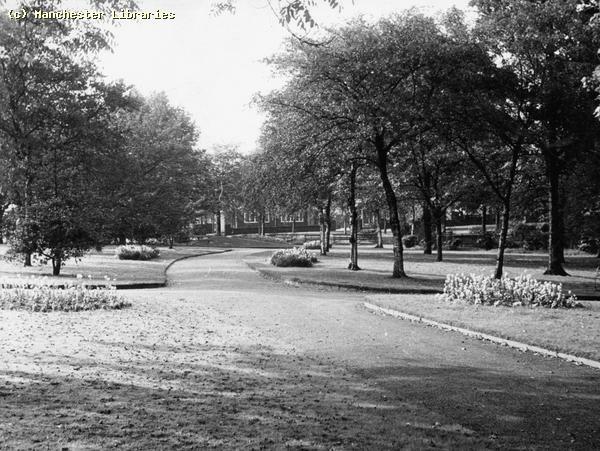 West Point Park. 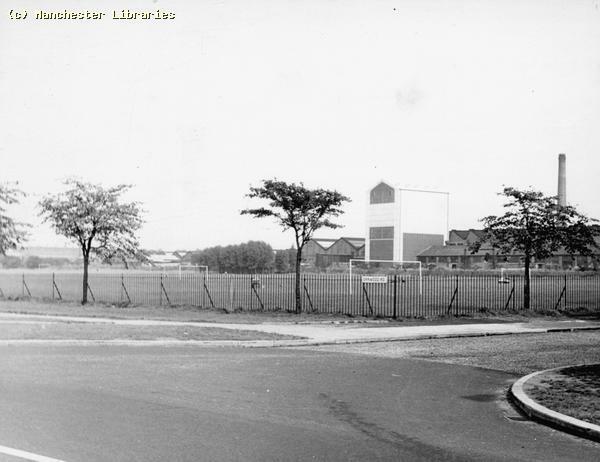 West Point Levenshulme. 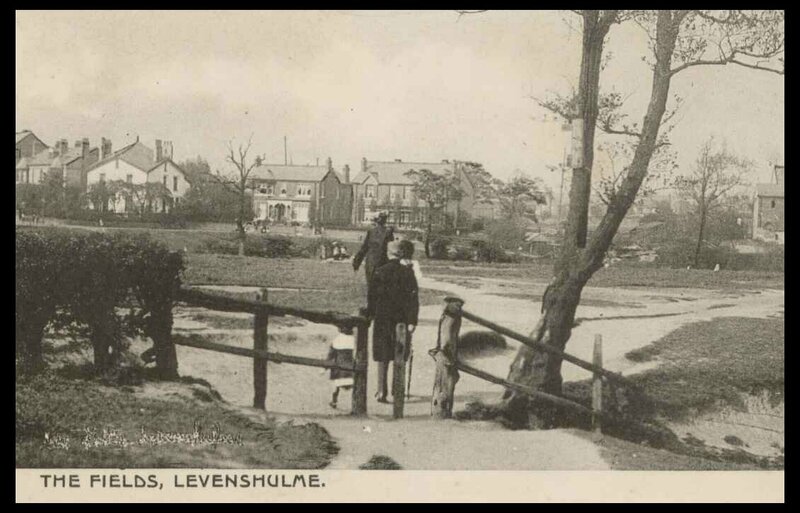 Levenshulme appeared to have had two separate cricket clubs. 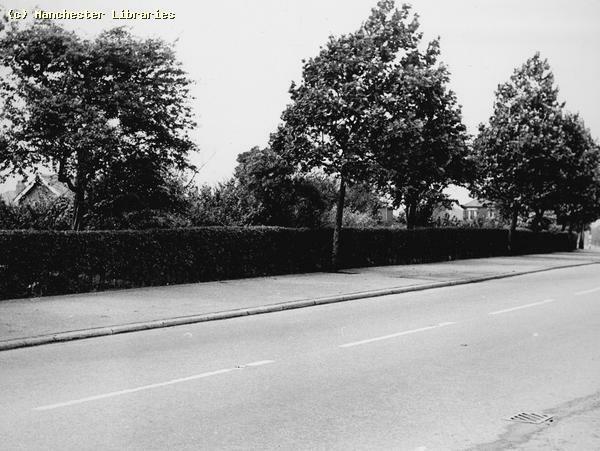 One off Slade Lane & the other off Elsa Street/Barlow Road. 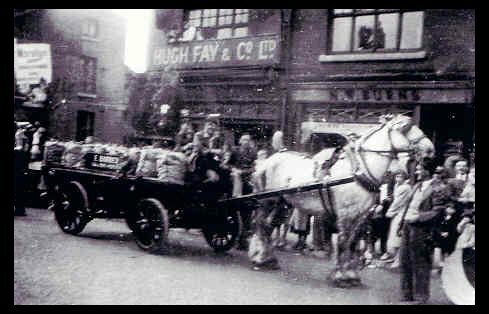 Do you remember the various Levenshulme Festivals, Carnivals & Fun Fairs? I have a vague memory of an event called "The Queen of Happiness"! 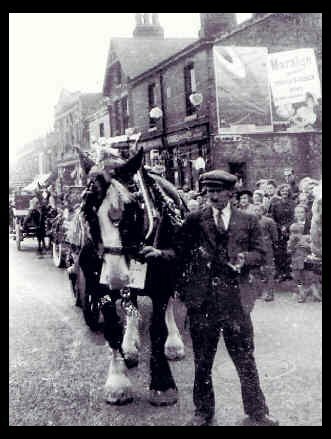 This may not be its correct title, but I believe it was a kind of May Queen event. 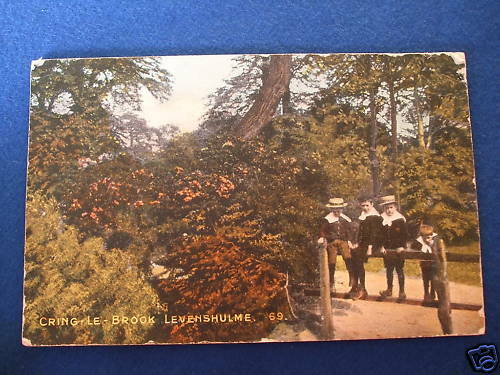 It was held during the summer, and consisted of a parade, events in the parks and possibly a fair of some kind held in Levenshulme Town Hall. The event probably did not last into the 1960's.